We have been receiving many inquiries lately as to whether we are an OEM (Original Equipment Manufacturer) company. After researching what the term means we found many references to the car and IT industries but no direct definition for other industries. In essence an OEM is a term used to infer that a company manufactures a generic (no label) product for another company to use with their label and to market in their designated field. Ortron has been an OEM company since its inception around the 1980’s. The term used then was contract manufacturing whereby Ortron would prepare a product, fill in the clients preferred packaging and labelled with the clients markings. With the advent of the common use of acronyms, this description can then be easily shortened to an OEM. One of the biggest benefits of this type of a relationship is that each company can concentrate on what it does best. We at Ortron are able to manufacture and release a finished product and this is our strength. Our clients can then concentrate on the marketing and selling aspect of the products. This is the strength of our clients as they understand what their customers want from label design and packaging needs. Our clients are also able to set up shops and franchises to help distribute their unique products and equipment. Therefore OEMs rely on their ability to drive down the cost of production through economies of scale. Also, using an OEM allows the purchasing company to obtain needed components or products necessary for their market without having to own and operate a factory. What is a moisturiser? Is it the same as an emollient a humectant or a hydrotrope? Moisturisers, emollients, humectants and hydrotropes have one thing in common, they all deal with water in one way or another. There seems to be a misconception that moisturisers and emollients are the same thing. Unfortunately they are not exactly the same, hence they have a different name. A moisturiser is an emulsified blend of fats, waxes and oils which utilises properties of those certain chemicals to enhance the moisture retention level on the skin surface. This drying out of the skin also results in premature aging of skin. The skin starts to lose its elastic properties as there is some damage to the collagen and elastin under the epidermis through the heat and drying. Therefore a moisturiser must allow the skin to “breathe” and also to maintain a balanced level of moisture. This helps to maintain its suppleness but only as long as the moisturiser is always present. Unfortunately we perspire and the cream dries out so we need to regularly apply the cream to achieve maximum effect. An emollient is a product that “softens” and “oils” the skin making it more pliable but not necessarily retaining moisture onto the skin. If anything it may actually occlude rather than retain the water onto the skin. So “Sorbolene” creams are mainly emollients but not very good moisturisers as they are made up of heavy emollients such as vaseline or petroleum jelly with some emulsifiers. A humectant is a product that reacts with water, binding it hydrostatically into a mesh type network. This doesn’t necessarily result in any type of moisturising effect as the water is hydrostatically bonded within the humectant molecule. This is invariably used to prevent a product from drying out. 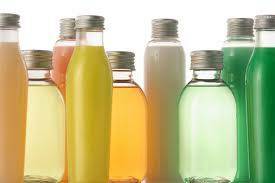 Examples of a humectant is propylene glycol, glycerine, and sorbitol. A hydrotrope is a product that binds water through electrostatic forces due to their strong affinity to water (through their hydrophilic, or water loving, head) and some organic molecules (through their short chain hydrophobic, or water hating, tail). Hydrotropes are fantastic when used in products such as conditioners. Through its ability to capture water molecules and bind them tightly to an organic phase (the hair follicles) they prevent hair drying out through harsh hot blow drying. Some examples of hydrotropes are cyclodextrin, dendrimer, sodium benzoate. Are sun screens really as effective as people wish you to believe? This discussion wants to debunk some notions which have been established as being irrefutable proof why current sunscreens are the most effective and why the SPF classification can tell you everything about the skincare product. You sit in the bus and notice that the cloth covered seats that had bright colours, seem to have faded. The heavy drapes and curtains you draw on the windows to block out the worst of the days heat seemed to have faded and the polyamide backing appears to be disintegrating. Why do women who wear foundation on their face seem to suffer less of melanomas on the face than do men? The question to ask is why these events happen. Current thought dictates that all these events are occurring because of the UV A and B rays. These are high energy short wavelength beams which penetrate any living matter and cause alterations in skin, fabric, dyes etc. thereby creating serious damage. All sunscreens must carry a Skin Protection Factor (SPF) which is a theoretical figure to designate the amount of time you may be able to stay in the sun without being sunburnt. The figure is relative to the length of time to get sunburned with the sunscreen on as opposed to not having any on at all. So in theory a sunscreen with an SPF 30 would allow a person to stay in the sun for 30 times longer than with no cream on before being sunburned. So if it takes you 20 minutes before you get sunburned at the peak of the heat of the day, then with the cream on you would theoretically be able to be in the sun for 600 minutes (10 hours). Problem is you perspire and so expose regions to the sun and can burn in those areas. This does not take into consideration skin types, location of sun exposure (ie near the equator as opposed to near the poles), what time of the day to be exposed, melanin content in the skin etc. Most sunscreens that use an SPF are chemical sunscreens. These types absorb the UV rays through complex reactions with chemicals in the sunscreen. These can be very effective for UV rays although side reactions may lead to by-products which may not be so desirable on the skin. Firstly we need to understand what these UV rays are. Broadly speaking nature has a very broad spectrum of wavelengths going from the shortest to the longest wavelength as shown below. They range from Gamma rays then X-rays, UV, Visible light, Infrared (IR), Radio wave and Microwave. So from this you would logically think that the shorter the wavelength the more “penetrating” it would be. Now we need to clarify some perceptions that have been bandied around which theoretically have problems in its logic. It is a fact that UV rays do not pass through glass (a non-crystalline material) but yet can pass through quartz crystal. So when an object or person is behind a window or glass sheet, UV rays do not reach the target. So what is it that created that skin burn when you were in that air conditioned car behind the closed window? The answer has to be something with a longer wavelength. Although you can “see” the visible spectrum, which are colours (therefore able to pass through the glass), it does not have enough energy to create damage to the skin. The damaging portion of the spectrum is the Infrared (IR) rays. Infrared easily passes through glass and is what we feel as heat. The IR wavelength has a frequency which matches the size of the water molecule. It is long enough therefore to spin the water molecules in skin. They rotate faster and faster until they “evaporate” off the skin. So when you are in a car with the air conditioning on the atmosphere is dry, which will dry out the skin quicker. Once the skin has no more moisture to protect it the skin starts to denature (much like what happens when you boil an egg and the albumen changes form). This denaturing creates what we perceive as pain and burning. After this burning, we have the blistering of the skin which leads to that typical peeling of the skin. So moisture is very critical to skin. Another example of how water can protect skin is if any acid spills on your skin you will not feel an immediate burning sensation. There is a reaction on the skin which leads to a warming sensation. This heat is due to the reaction between the water molecules in the skin and the acid. When there is no more water to react with the acid, then the skin will start to burn or denature (giving the stinging sensation). So there is enough time to wash most acids (not all) off the skin before any damage is created. So what should we do to protect our skin from the effects of sun and heat? There may be some merit to protecting the skin against the action of UV rays but the fundamental thing that the skin has to have is moisture. The skincare cream that is applied needs to have several things in order to be effective. 3. There needs to be reflective materials in the cream so as to “bounce” or reflect the UV and IR waves away from the skin thereby protecting the penetration into the areas where the most damage occurs. So if you cannot get your hands on an appropriate skincare cream for outdoors find a suitable moisturiser and liberally apply as often as necessary so that the skin does not dry out. The ideal cream to use would be Australian Melaleuca’s patented Skin Protector Cream which has the appropriate Hydrotropes (water trapping chemicals) and micronised metal oxide compounds needed to reflect the harmful rays. It also contains the emolients and penetrating agents needed to ensure long lasting effects. Contrary to most creams it will be effective even when perspiring heavily, swimming etc. This cream is only removed by washing with a body cleanser. For regular use we also recommend Australian Melaleuca's Hand & Body Lotion which is also a very good moisturiser with very good hydrotropic materials although with no ability to filter out harmful wavelengths from the radiation spectrum. How to choose the appropriate packaging? Which packaging would be appropriate? If the packaging is too showy then there is no justification for the expense of the packaging which places significant financial pressure on getting good returns on the initial sales. If the packaging looks very expensive then people will not buy it because of a perception of the article being too expensive. This would then necessitate a big budget invested into the promotion in order to establish the brand name. If the packaging is too plain and simple then it will be perceived as cheap. Your skincare range won’t stand out unless you design a very eye catching label to display on the packaging. How can you make the product look elegant and classy while also having a presence on the shelf? Before choosing packaging it is necessary to understand what your skincare creams, lotions and liquids are made of as this will impact on what can be used. Ortron as your contract manufacturer and formulator, could help you to choose the appropriate materials for jars and bottles and so avoid having to invest in the cost of researching compatibility tests on the packaging. Essential oils such as Tea Tree oil for example, is not always compatible with polyethylene plastic as the oil can travel through the wall of the container leaving a sticky residue on the outside. Packaging made of PET cannot hold a solution which has a pH greater than 8 to 8.5. Oils like IsoPropyl Myristate (IPM) can actually make the packaging brittle by stripping the plasticizer from poly vinyl chloride (PVC). Many plastics cannot tolerate hot filling which may be necessary for lip balms, waxes, some hair gels etc. There are many packaging suppliers on the market. Many will require that you order a minimum order quantity (MOQ) which can be around 5,000 to 10,000 units. This mainly applies when the packaging you want is very exclusive. Ideally it is best to deal with a supplier that has a wide variety of packaging and that they have them available “on the floor”. This means that the company has a regular stock of that type of packaging and therefore will supply any amounts needed. The one big disadvantage in buying small quantities is that you end up paying considerably more than in pallet or box quantities. Ideally to minimise cost you should try to purchase the packaging in box lots which may be from 100 to 500 units although this may vary depending on the packaging size. In this respect Ortron is sometimes able to get better prices because of the volume we are able to purchase from the suppliers. In most cases it is advantageous to deal with the packaging supplier that your contract manufacturer deals with. Our preferred supplier is Vision Packaging and you may wish to investigate their packaging range on their website at www.visionpackaging.com.au. 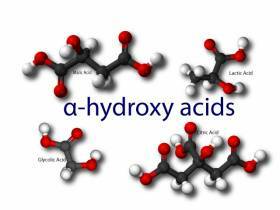 Are alpha hydroxy acids (AHAs) harmful as an exfoliant? Are alpha hydroxy acids (AHAs) harmful as an exfoliant on the skin and what are the alternatives? There are many methods of achieving skin renewal (exfoliation) in order to get back that youthful glow to the skin’s surface. Some skincare products use chemicals, some are physical and some are enzymatic (proteolitic enzymes that consume dead skin) exfoliants. The simplest exfoliant is physical. The physical method uses abrasives. They can be quite aggressive and may leave some scarring from using these abrasive materials (such as crushed walnut or almond shell) to scrub off the dead outer layer. Admittedly this is a relatively cheap and effective way of bringing back a shinier skin but in some cases there are repercussions from using abrasives, namely soreness and redness of the skin (acne skin should never use this method). These may take several days to settle down and heal before the full effects can be seen. The chemical method is the most aggressive type. The worst type use phenolics and resorcinol which are known carcinogens. Have you ever noticed that when some people are exposed to sun, they appear to blush? This blushing does not disappear until they leave the warm environment. The reason for this is that they may have used a chemical exfoliant which are known in the cosmetic and skincare field as Alpha Hydroxy Acids (AHA). These chemicals are organic acids and are used as high concentration acids. These include examples such as glycolic acid, Kojic acid, retinoic acid (vitamin A), etc. These chemicals act like any acid does except that they are more destructive than mineral acids (sulphuric, or hydrochloric acids for instance which can cause severe burns but can be neutralised before any great damage is done). The AHAs have a strong liking for the proteins in the skin such as the amino end groups and begin to burn from those points by dissolving cell bonds and so undermine the integrity of the skin. This can result in the exposure of the melano sites in the skin. When these are exposed unsightly brown colour stains or blotches can appear on the skin. Once these acids have bonded to these groups there is no way to “neutralise” or dilute them. So they are unstoppable. What then happens is that they begin to react indiscriminately with all of the skin, be it dead or live. Unfortunately the reaction continues until the acid is all “used up”. The role of the acid is to “burn” off the outer layer of the skin (regardless whether it is old dead skin or live fresh skin) and force the skin to repair itself by producing a fresh layer. The method is to create enough of a burn that the skin blisters. Eventually the blisters “fall” off (much like a sunburn). If this process is performed often enough then eventually there is no more skin able to properly cover the capillaries in the outer layer of skin. Asian skin is much finer than European type and so are more significantly affected by these acids (brown stains). The capillaries help in the maintenance of body temperature. When the body gets hot, blood flows through these fine blood vessels and are able to cool the blood by natural radiation and dispersion of heat. Very much like what the radiator does for the car in order to maintain a certain motor temperature. When these capillaries are exposed to the elements then the blood is clearly seen to course through them, giving the appearance that the person is blushing or getting a hot flush and cannot retreat easily to normal until the person returns to a cool environment and their body temperature cools down. It is yet to be formally acknowledged whether AHAs are harmful to the skin but there seems to be evidence that it cannot be good for it. Eventually someone will be seriously affected by it if there haven’t been cases registered already. There are alternatives to the physical and chemical exfoliants. These alternatives are specialty ingredients called “proteolitic enzymes”. These enzymes are more selective with what is being consumed. They are more interested in consuming the dead skin cells only and leave the healthy skin cells alone. They act a bit slower than other methods of exfoliation but their lasting effects are much more profound. Ortron has carefully researched which types of enzymes can be used. Ortron needed to be very careful which enzyme to use as some enzymes can be rather aggressive, such as the pineapple enzymes, which are very acidic. Ortron has developed a patented papaya enzyme skincare range in cream and gel forms. In these creams the enzymes work symbiotically with several herbal extracts which achieve cell turnover. These give lasting and more desirable effects on the skin with very little, if no side effects at all. The enzymes take a little longer to achieve the desired results than the chemical and physical methods but with no harmful side effects of the others. Papain is a non-irritating stabilised acid-free exfoliant which operate in the pH range of 6 to 7. Papain is a natural enzyme derived from the unripe papaya. The enzyme only digests the dead cell layer of the skin causing no damage to the underlying living cell layer (Proteolitic enzyme). People with sensitive skin can easily tolerate papain enzyme therapy whereas they may not handle the irritation often associated with AHAs , Retinoids and to a lesser extent BHAs in water based creams and gels. So you want to start up your own skin care range? Why should I sell someone else’s skin care products when I can sell my own range? I can’t seem to find any skin care product in the market that fulfils what I believe a product range should do. Can I make a better skin care range? I have ideas on wonderful ingredients that should be marketed on my range. Who can contract manufacture and help me launch my skin care range? Many people have the same great idea of starting their own skin care range but need to know what is necessary for them to research before they invest in launching their cosmetic skincare range. 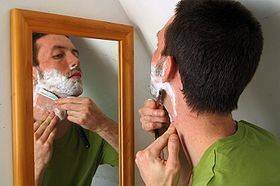 What market are you targeting for example mature or oily acne skin etc? 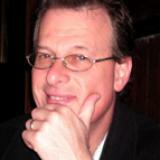 Speak to a contract formulator that will put your product together so that you sell a finished range. Try some of it on themselves to gauge how it feels and once again how it smells on themselves. Rest assured that once people have tried your skin care product range and are convinced of the high quality then there is every possibility that you will have repeat sales. The internet may not always be the best way to launch SALES of your range but is an excellent way to launch your CONCEPT and show how your product is exclusive and unique. Using online selling can enhance your sales but if you are using this as the only distribution channel it may not provide the volume throughput you require to become viable long term. Before introducing your new moisturising cream for example, you need to know that the people can buy the products from somewhere. This can either be via a shop or chain of shops or via a link to a webpage shopping trolley system. The last option is really to be created once you have developed a name for yourself. There will always be the limitation on the fact that people can’t touch and feel the product. Ortron, as a small volume cosmetic contract manufacturer, has a vast and diverse library of over 350 cosmetic formulations which we can draw upon. These range from acne treatments to foot treatments. We have the skin care product that can treat your customer from head to toe. So we trust that this article has provided you an insight to where to start and rest assured that we at Ortron are very likely to have the right skin care formulation to give you the head start to make the product which will suit that very special ingredient you have in mind and we can formulate this in your product to do what you will need it to do.